Why is Audi Called Audi? Audi was founded in 1909 by automotive pioneer August Horch, in Zwickau, Germany. Born in 1868, Horch trained as a blacksmith then studied engineering. By 1896, he managed an engine workshop for Karl Benz in Mannheim. To put this in perspective, Karl Benz patented the first car only 11 years prior. In 1899, Benz & Co was the largest automobile company in the world. But, Horch had his own ideas about engineering. He left Benz in 1899 and opened his own shop, Horch Motorwagen. He built his first car in 1901, drastically improving the driver’s experience. Horch was also a racing enthusiast. Impressive victories against established names like Benz and Mercedes in the 1904 Berlin-Leipzig-Berlin and 1906 Herkomer Races proved Horch manufactured winners and that equalled success. Horch understood the importance of motorsports in building a reputation and selling cars. According to Audi’s website, it was a dispute about racing performance that forced Horch to leave his own company in 1909. A few weeks later, Horch launched a second venture. 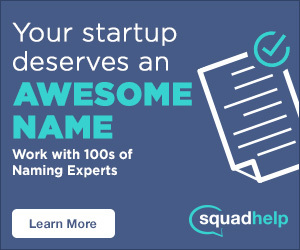 The name? August Horch Automobile Works. As you might expect, the name was a no-go with his former business partners. The courts agreed and declared the Horch name was protected under trademark law. Why is it Called Audi? So, what to do? The story goes, August Horch visited his friend Franz Fikentscher. They tossed around ideas for new names over dinner. Franz’s 10 year old son, Henrick, a Latin student, overheard the discussion. It was young Henrick who suggested Latin: a translation of Horch (meaning ‘to listen’ in the imperative form ‘hark,’) and that was Audi. The first Audi cars appeared in 1910 and August Horch set his sights on one of the most difficult runs in the world, the Austrian Alpine Rally. Ferdinand Porche won the 1911 race – but Audi would go on to win three consecutive years: 1912, 1913 and 1914, which drove international brand awareness. Horsch later retired as Chairman in 1920 for a position with the Ministry of Transport, but remained on Audi’s Board of Directors. He is a member of the Automobile Hall of Fame and his autobiography “I Built Cars” (Ich Baute Autos) was published in 1937. If you enjoy car history, you will probably enjoy a virtual tour of the August Horch Museum online. What do the four rings in their logo symboloize? In 1932, four German automakers, Audi, DKW, Horch, and Wanderer merged to survive the economic crisis and became the Auto Union. This created the new logo, four interlocking rings representing strength and unity. Post WWII, in 1958, Daimler Benz acquired what remained of the Auto Union and Volkswagen purchased Audi six years later and entered the US market. Doyle Dane Bernbach and Helmut Krone, the advertising power team behind Volkswagen’s landmark campaigns of the 60s, were also behind the vision for Audi. DDB set the stage for the Audi we know today. A brand is a living entity and requires nurturing to keep pace and project a vision into the future. 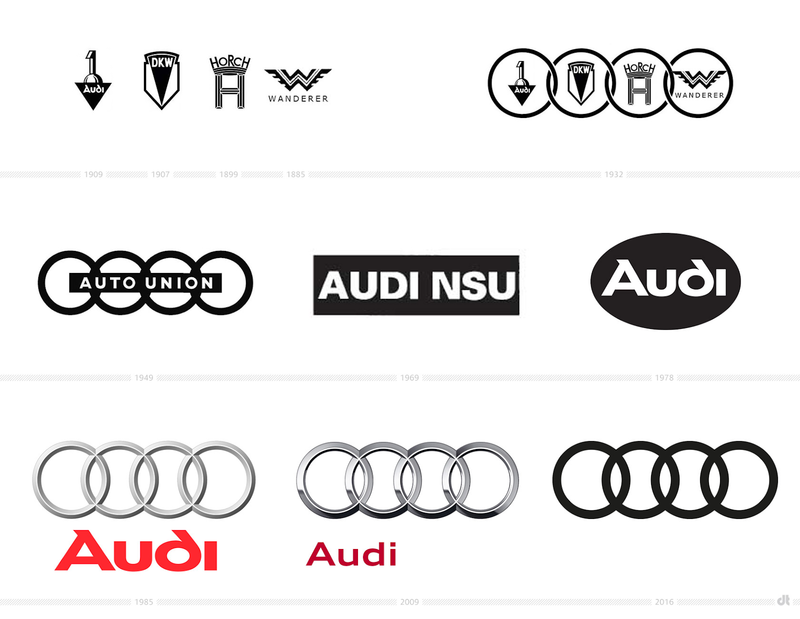 Here’s a look at the evolution of Audi’s logo. Some people confuse the Audi and Olympic logos. Have you? A little history, the Olympic Rings debuted at the 1920 The VII Olympic in Antwerp. Auto Union’s four ring logo came on the scene in 1932, a few years before the 1936 Berlin Games. We can see how that might have been a problem! The Olympic and Audi logos evolved over the years – but that wouldn’t stop the International Olympic Committee from suing Audi in 1995, however they came out empty handed. Fast forward to the 2014 Sochi Olympic Games opening ceremony fireworks. Due to an unfortunate glitch, one of the five Olympic rings failed to ignite as the world watched. A fake ad, attributed to Audi fans, with the mis-fired display above two cars sprung up on the internet. 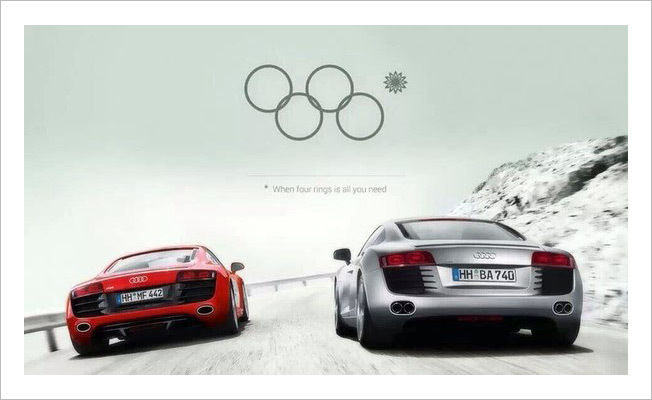 The clever tag line: “when four rings is all you need” went viral. 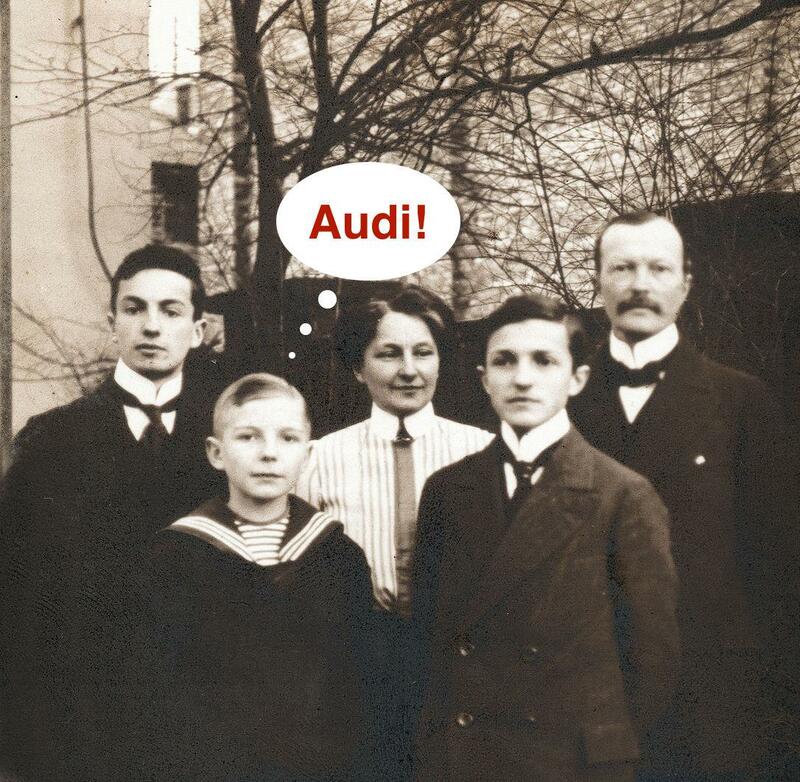 We hope you enjoyed reading the naming story behind Audi! Would you buy a car named Horch today? Tell us, what’s your favorite car name? Comment below!